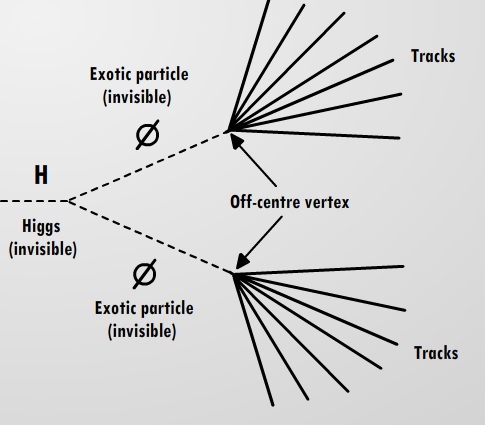 In reading up on the LHC and ATLAS, I came across Matt Strassler’s blog, and a recent blog post on detecting long-lived particles. This seems to be directly related to what we’re doing, in Higgs Hunters! He mentions the importance of “trigger strategies”, and how lots of interesting physics may go unnoticed because the “triggers” were not designed to capture events which might point to such physics. Is this, in fact, related to what we’re doing? And can you please say something about “trigger strategies”? Matt and I go back quite a number of years (he was at Seattle when I was a grad student), and his ideas were central to these sorts of searches. I think he plans to blog specifically about our HiggsHunters project next week. The trigger for the data for this search was easy. We rely on the fact that the Higgs is often (~10% of the time) produced along with a Z boson, which then sometimes (~3.3% of the time) decays to a pair of muons. This gets a large enough sample of Higgs decays to have a chance of spotting something interesting, but admittedly we are throwing out 99.7% of the Higgs produced! If the Higgs boson decays very rapidly and the mass of particles does not change, it seems to me that new Higgs bosons must be being created. Do we know how they are created?